As you can see, I’ve split the Surveys into two groups. Standard methodology surveys – the ones based on in-home, face-to-face interviews – and surveys using alternative methodologies. The standard methodology surveys all give Chavez a big lead. Plenty of people in the opposition are certain that these results reflect intimidation: people can’t be sure that the person polling them is who s/he claims to be. According to the argument, the government has a history of discriminating against dissidents in parceling out state benefits, and many people fear giving the wrong answer to a “pollster” which could undermine their access to state social programs, jobs, etc. Three surveys have been carried out using three alternative methodologies meant to control for this so-called Fear Factor. Rather than a voting intentions survey, Keller does a political segmentation analysis to determine whether voters broadly agree with one side’s rhetoric or the other. 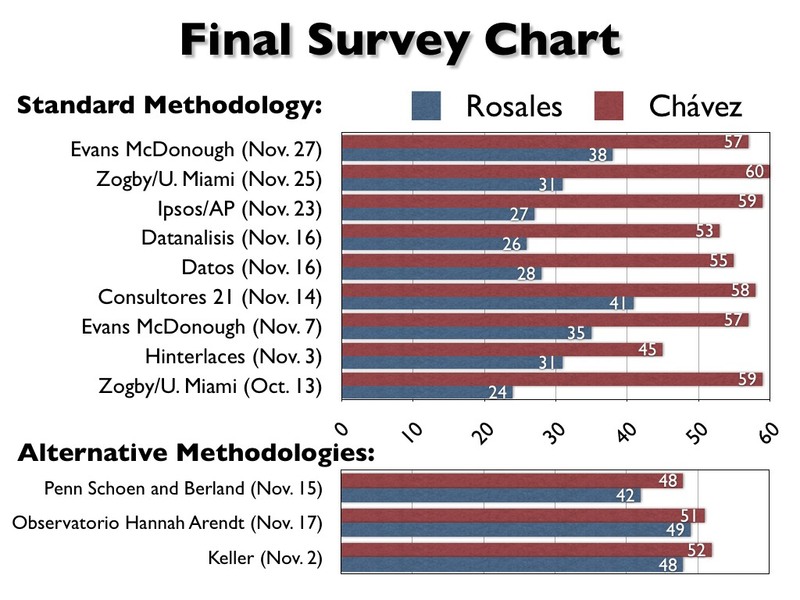 PS&B use a “secret ballot” methodology where survey respondents deposit their opinion in a box, without having to “come out” to the pollster, while the Observatorio Hannah Arendt (which, caveat lector, is not a recognized pollster but rather a group of academics and activists with apparent ties to the Rosales campaign) replicated the methodology used in this famous study of the 1990 Nicaraguan Election. Personally, I think that even if the alternative methodologies are closer to the mark in terms of underlying preferences, there is no reason to believe the Fear Factor won’t follow people right into the voting booth. In particular, public employees are badly exposed – how many will really “dare” when crunch time comes? In any case, these are the polls that are out there. Do with this chart what you will.